I scooped up this recipe from MFP, where someone had previously found it on tumblr. Combine ingredients in shallow dish. Microwave mixture for 2 minutes. 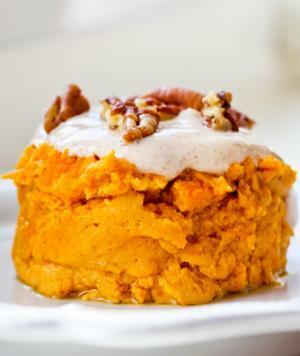 For a creamy topping, mix together a dollop of non-fat Greek yogurt, a little bit of hazelnut cream cheese, and pumpkin pie spice, or top with toasted pecans.